Ever since Greg Johnson and his team at HumaNature Studios launched their ToeJam & Earl: Back in the Groove Kickstarter campaign, fans have been asking for console versions of the game. In talking with us during our exclusive interview, Johnson said it was something he wanted to do but was hesitant to make the commitment because he didn’t want to overpromise and was unsure how long the porting process would take, so he wanted to focus on developing it for the PC first. Today, he announced a slew of new stretch goals, including console goals for the PlayStation 4 at $600,000, Xbox One at $700,000 and Wii U at $800,000. 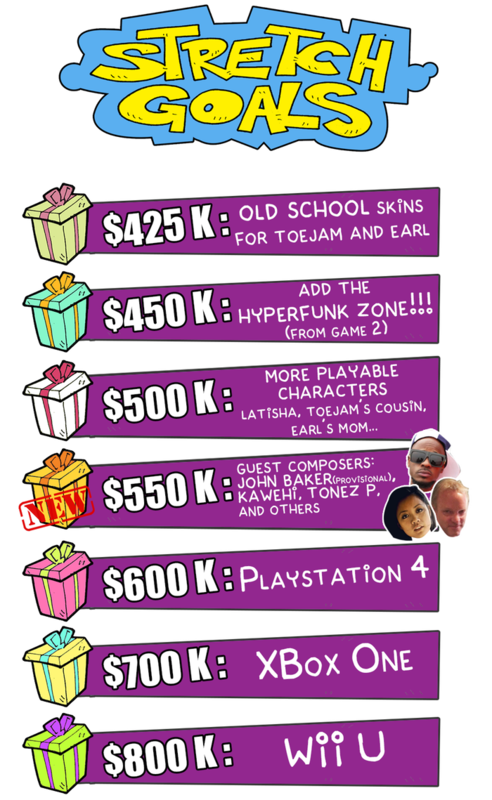 Included in the other stretch goals are options to include “old school skins” for ToeJam and Earl, the HyperFunk Zone featured in ToeJam & Earl in Panic on Funkotron, more playable characters (including Latisha!) and several guest composers. 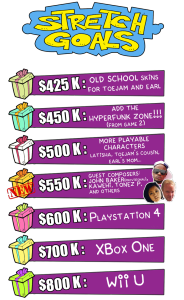 If anything, we’d love for the Kickstarter to at least reach the guest composer stretch goal as John Baker, the original composer from Panic on Funkotron has agreed in principle to help with the game’s soundtrack. You can contribute to the game’s Kickstarter campaign and learn more here.